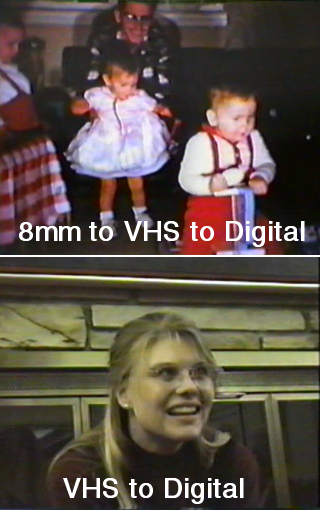 Recently, I wanted to get photos of my cousin from old home movies, and to digitally capture and editÂ an historic VHS tape ofÂ an interview with the co-pilot of the Bock’s Car. You canÂ capture photos and digital videos from VHSÂ with a handy product calledÂ VidBox, available from BestBuy ($60) inÂ bothÂ MacÂ orÂ WindowsÂ versions. 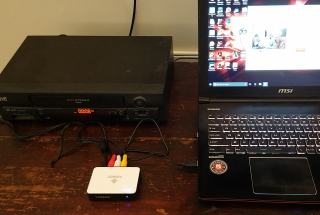 As seen here, VidBox connects to your old VHS’ RCA jacks and to your computer’s USB port. VidBox includes software to capture the video as it’s played, and you get a nice digital file to edit. For editing, I usedÂ CyberlinkPowerDirectorÂ andÂ PhotoDirector.Â (About $99 in a bundle.) PowerDirector makes it relatively easy to add photos, music, and video clips to create interesting videos, and PhotoDirector lets you capture photos from video, as well as re-touch and create sophisticated effects. The oldest images were originally shot on 8mm and transferred to VHS by videotaping a screen. Direct-to-VHS yielded better results, but both gave me the feeling that I was reaching back into history to capture some wonderful, evocative photos that had been – until now – lost to time.